Get ready to re-center your body and mind with wellness tools that will help you perform massage techniques to enhance function and assist healing, while promoting relaxation and wellbeing. 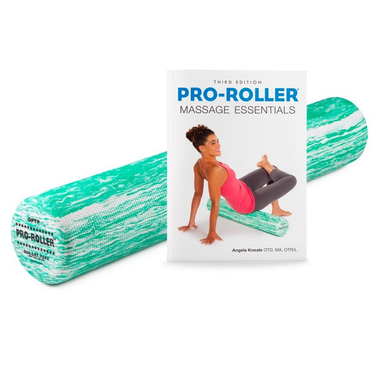 The OPTP® PRO-ROLLER Standard foam roller and the popular book PRO-ROLLER® MASSAGE ESSENTIALS are the ideal tools for those looking to roll-out tension and actively release muscles, fascia and connective tissue. Purchase these essential items as a set at the special price of $34.95 for a short time only! These professional-quality foam rollers feature a highly durable EVA foam construction. With a comfortable, medium level of firmness and multiple size options, these rollers offer a variety of uses and benefits including massage and myofascial release, physical therapy, Pilates and yoga exercises, and more. Available in green marble or blue marble. This revised 3rd edition foam roller guide, provides recent research about the benefits of foam roller self-massage and comprehensively walks readers through more than 40 exercises, and numerous modifications for rolling and releasing sore or tight muscles, fascia and connective tissue. Written by Angela Kneale, OTD, MA, OTR/L, NBC-HWC, this book includes step-by-step instructions with descriptive photographs to help you gain the benefits of foam roller massage.